Do you all recall those meetings where 20% of the people contribute 80% of the time? We’ve all been there, are there now and should be focussed and not reading this, are just about to go there or were there earlier and are on the way to the coffee machine for the real meeting. The problem here is that some of the best ideas and insights don’t get captured or even brought to life, people feel disengaged because they don’t have a voice, we second guess what people are thinking and bad decisions get made. We can change that right now! Make things less personal. Business is business, but without people we wouldn’t have businesses. This shouldn’t stop us saying something out of fear of upsetting someone or 'treading on their toes'. Give everyone a voice. The process used should ensure we get everyone’s view of the problem/challenge and possible options. Doing this will ensure all possible ideas have been shared and prevent someone saying ‘well if this goes wrong it’s nothing to do with me’. The whole team becomes accountable not just a select group of individuals. Foster Creativity. You can’t plan to be creative. Whenever a collective of people get together, it should be in right environment to allow ideas to flow and connect both the left and right side of the brain. Ask the right questions. Questions/challenges should be well thought out in order for the team to solve the right things. The best questions have many possible answers and then the team decide on the best possible outcome. Allow people a view. After all it’s only a view. We all see things in different ways, remember we might be stood next to each other but we have so many things that make our perspective different. Someone else’s view will help ensure the full picture is the picture as is, not the picture as imagined. I've found by using the LEGO® Serious Play® (LSP) Methodology you can achieve all of the above. This amazing use of bricks from the most famous household brand in the world allows you to get deeper and broader in your objectives in a shorter time. Generates more effective meetings for everyone and better decisions. To answer well thought out questions, individuals build their own 3D models using specially selected bricks. These models form the basis for discussions sharing knowledge, ideas, solutions and more. There is no need for technical knowledge about LEGO® as there is always ‘tech support’ available if you want to create a specific connection with your model. LSP starts with individual models, meaning everyone is required to be actively involved, this increases the likelihood that everyone involved will hold up to decisions and action points after the meeting. The key to success is that the models are used to describe the answers – the answer is in the model somewhere, everyone should look at the model to see the metaphor and the builder should talk to the model pointing to the meaning of its parts. This forms the framing of ‘it’s the way I see it’. In certain parts of the world it is bad manners to look people in the eye when talking to them, so here we can bear this in mind when talking to the model and not making it personal. During the process it's absolutely key that if someone has taken the time to build their answer to the question it should be shared, this ensures people are involved, their ideas are heard and all the information is made available. One by one the group share their answer before any further action is taken or questions asked to clarify. Here’s an example that I've used before called Build Your Quarter. Get the group used to the concept of fiddling with bricks. Ask them to build a tower using a maximum number of bricks or only two colours of brick and to finish it off with a tree. Once complete and everyone has the tower have look around and see just how different they can all be, yet with the same instructions given to everyone. There’s no right or wrong answer and throughout the session the group must know that the model has the answers. Then ask the group to modify their individual tower, adding no more than 5 extra bricks, to show a skill they bring to the team. Give them around 2 ½ minutes (this gives them a sense of urgency and need to build). When they’ve all got one model ask for a volunteer to start off and tell the story of their tower and strength. They should show aspects of their story in their model and encourage the group to look at the model not the person sharing. You can either leave the models on the table or take them apart, but the next step will be to ask the group to build individual models of what will make the next financial quarter a great success for them? They can use any bricks around the room, but it must be a single model per person. Give them around 7½ minutes for the build. Once complete they should push spare bricks towards the centre of the table making space for everyone to see their model and be prepared to tell the story. Now ask for a volunteer to tell the group about their model and what great success will look like in the next financial quarter. Encourage the group not to ask questions, but to congratulate each storyteller and remember there is no right or wrong answer, it’s just their view. Once everyone has told the story of their future success, invite questions. Frame it so that people ask questions only to build their understanding of the builders’ model. This is where it starts to get even more powerful. By now everyone will have shared their thoughts around what they bring to the team so you will have learnt something or clarified something. You will have also gained an understanding of each person's priorities for what’s coming up and how busy they are. So let’s turn this into a team aspiration. Give each person a red brick (2 x 2, 2 x 3 or 2 x 4 type size) and ask them to attach the red brick to the part of their model which is the most important thing for them to achieve in the forthcoming quarter, there may be some similar or the same after all you are a team. This doesn’t matter at this stage. Now give the group 15 minutes to make one model (it can be on a building plate if they wish and if you have any) that represents the teams shared aspirations for the forthcoming quarter – as a minimum it must include everyone’s ‘red brick’ aspect. Offer tech support if you can or need to ensure they are able to connect it, but only tech support, anything else will add your meaning to the model. 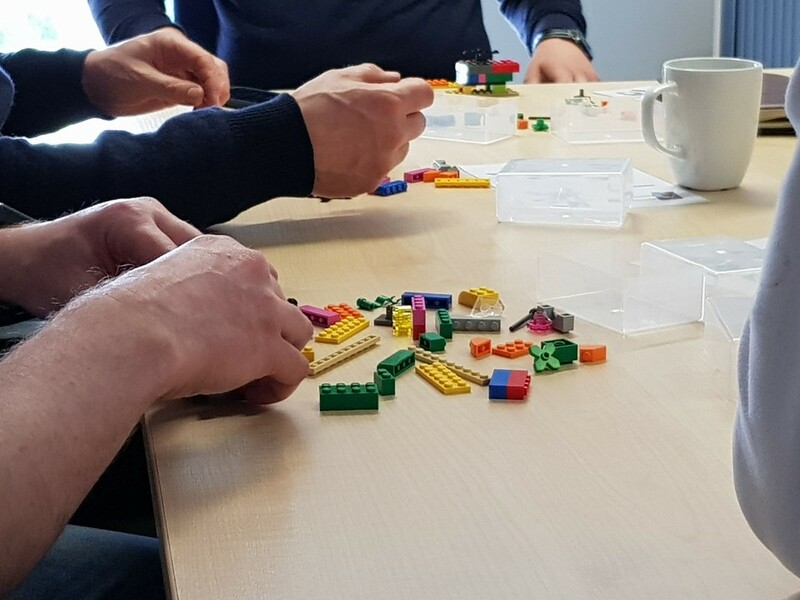 Once complete check with the group on individual aspects of the shared model, this ensures they all have their ‘red brick’ in the model and people are clear on each-others’ own objectives. Now ask if there’s someone willing to start you off by telling the story of the next quarters’ success. They should frame it by starting off with “In order to have great success in the next quarter we must…” they then talk through the entire shared aspiration. Congratulate the first volunteer for stepping up to the plate and confirm it matches everyone’s aspirations. Then go around the group and ensure everyone tells the entire model’s story. The model should have everything in it that is told and the group should point to and talk to the model each step of the way. This ensures everyone can articulate the objectives, that they belong to everyone and the whole team is then committed and accountable to the results. I know this may be a little different for most of us, but it really works. This really changes the way we have meetings, more importantly though it drives commitment and accountability on agreed actions. After all meetings can be powerful, but the most important thing is what happens after the meetings right? If you like what you've read and it has got you thinking and wanting to know more, send me an email at: martin.peterson@thesuccessfactory.co.uk or just let me know if you use it and like it. Martin is a Senior Training Consultant at Successfactory™. With over 10 years experience he is responsible for developing and delivering inspirational leadership & development training that adds real value and drives positive action in many local and global organisations. I'm a passionate trainer who loves to explore new techniques and methodologies ensuring that everything I teach is up to date and relevant. I love helping teams and individuals to understand their strengths and exploring new ways for experienced teams and organisations to drive change and ensure sustainability.